This is the original Borg for C2, by bionorn and team. Note there is a Norn-R slot version as well. This is the original C2 Borg, by bionorn and team. These are the trident norns, made by bionorn and team. Graveyard Gargoyles are CFF norns who have spent to much time around a haunted graveyard. As a result, they are immune to fear and don't shiver when cold. Spending so much time in a graveyard has also given them stone-like abilities like being more resistant to being wounded, living longer, and a rather nice grey color. They also started sinking like rocks, so they became amphibious. 1. Ivrogne Canny Norns have JayD's Anti-Wallbonking edits built into them. 2. Ivrogne Canny Norns do not get punished for increases to hunger, boredom, NFP, sleepiness, or tiredness. 3. Both Male and Female Ivrogne Norns seek mates when they are sexually matured (Instead of only males searching). 4. Ivrogne Canny Norns have been designed to be better breeders than their Akamai Canny counterparts. 5. Ivrogne Canny Norns' needs accumulate more slowly, meaning that they are physically more capable than most other Norns at survival. 6. Ivrogne Canny Norns are fed faster, and they are much better at digestion than Akamai Canny Norns. 7. Ivrogne Canny Norns have more effective rests than Akamai Canny Norns, needing to sleep less often. Ivrogne Canny Norns do not come equipped with new sprites, however their skin is colored red (Deep red for males, light red for females). Special thanks to Venithil. Without his guidance, I could have never figured out how to make this breed the way I desired. Extra Note: If you prefer the base sprites, don't worry! They've been included as well. The Dodgy Norns are a breed of colourless Chichi norns which are included with Creatures 1 to Docking station. This breed was originally planned and started to be created by NornenMeister but while going into retirement for a while, he decided to cancel the project. So Alien finished this breed in the frame of her Pimp my Breed action with a brand new sprite concept and with the Original genetic files and sound files from NornenMeister. Opera Ettins have new voices based on opera sounds. Male looks a bit like the "Phantom of the Opera" and the female got a somewhat more glamourous costume with stars in her hair. Maybe to attempt to be a Queen of the Night? A random act of splicing turned into probably some of the brightest Norns you'll see swimming around your world. They're based on the Evo Norn genome, with a few tweaks to make them able to breathe underwater from adolescence (or from birth in the case of the Florafish norns), able to swim with the Swimming Agent from about the same age, and have stronger tendancies to play with/eat critters. They're also kind of colortrue, although given the gender tinting differences in the Butterflyfish, you might just end up with a lot of purple-ish Norns. They need the Butterfly Norn, Flora Norn, and Pearl Mermaid Norn sprites. A pack of Norn breeds, with a curveball thrown in. Includes the semi-alcoholic Jaderald Norn, the hardy Bridgewalker Norn, the Ombre Bridge Norn (basically a reskinned Bridgewalker), and the questionable Dandelion Half-Norn. More information on each can be found in the included text file. Between them all, they require these sprites: Bruin Norn, Bengal Norn, Civet Norn, Magma Norn, Treehugger Norn, Zebra Norn, Fallow Norn, Hardman Norn, Bengal des Neiges, Jungle Norn, Shee. And do keep in mind the usual geat-related precautions before you go filling your world full of Half-Norns! Flora Norns. Chichi CFF genome. You know the drill. ...Including my ability to not keep true to original genomes. I noticed the C2 version of the Flora Norns had a few extra quirks, so I tried to replicate them here. Notably, an affinity for the natural world and the ability to breathe underwater as well as on land. You will, of course, need the original breed installed. Also included is something I ended up making based on this genome, called the Coral Flora Norn. It isn't as colorful as another species named "Coral" out there, but nevertheless capitalizes on the "breathe underwater" part. It's not a gilled norn, but it does tend to eat critters more than most. The sprites of the Amphibious Dragon Norns were converted by Trix from Kathira's Dragons from Creatures 1. This version of the Amphibious Dragons use a by Kathira modified genome based on the 256er genome by Creature Labs. The Dragons have a life expectation of about 5 hours. They are already with 1 hour 22 minutes grown up. They are able to breathe underwater. An additional instinct tells the Norns that is good to drink something, when they are thirsty. 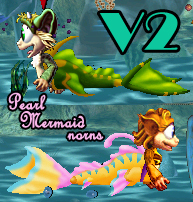 The Amphibious Dragon Norns have gender specifc colors. This Nornbreed use Ettin slot R.